When they're little, the exhaustion is primarily physical. As they get older, it shifts from physically to emotionally challenging. We want to love them and teach them. We want them to cooperate, listen, and learn so that they become empowered, self-aware people. Most of the time spent parenting focuses on our kids and what they need to do or learn or how they need to behave and respond to life. Today's guest challenges that idea. 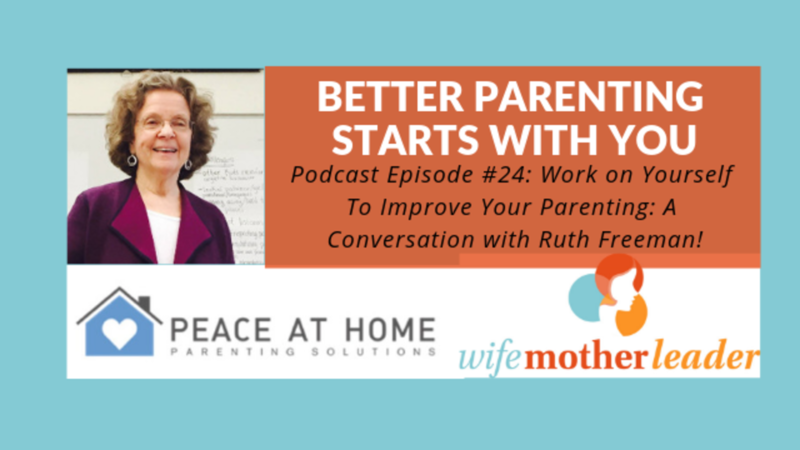 Ruth Freeman, a parenting coaching at Peace at Home Parenting and licensed social worker with over 3 decades of experience working with parents and kids, says that parents need to spend more time on their own thoughts and behaviors. How we raise our kids is a direct product of our own upbringing, fears, expectations, and societal norms. That isn't a criticism. It's an observation. Understanding it can help you identify what your current parenting style is actually communicating to your kids vs what you want to be communicating to them. While kids don't come with a handbook, there are trainings, educators, and best practices that you can learn. But, is that the way to raise successful kids? A book by Dan Siegel called Parenting from the Inside Out helps us understand that our childhood experiences influence our parenting much more than we know. When we understand this, we can forgive ourselves and address the messages that we might be telling ourselves about our parenting. Children are motivated to connect with us and seek our attention. By 18 months to 2 years, parents are giving most of their attention to misbehavior and trying to correct it. They are reacting to it, talking about it, and consistently responding to it. So, even if you're impatient or lecturing or threatening, it's still attention. When kids are cooperating and behaving well, they don't get nearly as much attention. Positive Discipline is a way to flip that attention so that it's focused on positive behavior. Start with a specific positive behavior that you want to encourage. Our brains connect with each other and we can mirror each other's emotions. If we are stressed or anxious, our kids will mirror that back to us. If our kids are frustrated and tired, we take on that frustration. This also means that we need to think about how we care for ourselves so that we don't pass along our emotional exhaustion to our kids. If you want to hear additional insights from Ruth as well as her story, tune in. And, check out Peace at Home Parenting's courses and parenting coaching.